At Google’s opening keynote at this year’s Game Developers Conference, CEO Sundar Pichai unveiled the future of game-streaming: Stadia. The correct plural pronunciation of the word ‘stadium’, Stadia will offer gamers an arena to watch and participate, game and stream their games to the wider world. It’s ambitious and, despite some huge unknown factors like cost, game library and recommended specs, potentially game-changing. 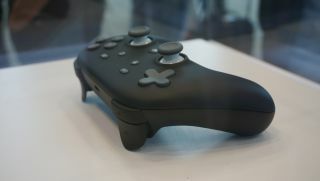 Part and parcel of Stadia is the new Stadia Controller – a Wi-Fi-enabled gamepad created by Google’s hardware team that will help you get the most from the streaming service when it launches later this year. Now, you don’t need the controller to use the streaming service: Stadia can be played with any controller you already own, including your keyboard and mouse if you’re playing on a laptop and PC. But this first-party controller unlocks the next-level functions Google is building into its streaming service, like Google Assistant, that offers in-game help on-demand and its Share button that will trigger Google to start a second stream of your game live on YouTube Gaming. Inside the halls at the Game Developers Conference we got the chance to check out the controller for ourselves and while we weren’t allowed to put it to the test for ourselves, we could get up close and personal with the bridge between you and Google’s hyper-powered streaming service. Whatever it says to the contrary, Google is a relative newcomer to the AAA gaming space. Sure, it single-handedly created the gaming-enabled Android TV, the operating system of both microconsoles like the Nvidia Shield and stellar Sony TVs like the Sony X900F, but it’s not the first name that comes to mind when you think of mainstream gaming manufacturers like Microsoft, Sony and Nintendo. That said, it’s no wonder Google has sought inspiration from 'the Big Three' in terms of its controller the design – the Stadia Controller is exactly what you’d get if you mashed the Xbox One gamepad with Sony’s DualShock 4. The result is a flatter gamepad that doesn’t have the sharp contours of the DualShock 4 or the indents of the Xbox One. Instead, it has this almost space-age look to it that some will love for its simplicity and others will decry as uncomfortable, awkward-looking and cheap. Pockmarking the face of the controller where you’d expect to find the Start and Select buttons are four new buttons in addition to the home button located in between the joysticks that we’ll cover in the next section. Last but not least, while Google has mostly shown images and video of a white controller, we were also able to track down a black version that was in a case outside the show floor. If you're looking for something different, Google also showed off a pastel green controller on stage at its demo that will likely be available at the same time as the other two. So what will it be like to use the controller to play games like Doom Eternal or Assassin’s Creed Odyssey? At this point no one really knows – Google included. That’s because the controller has not actually cleared the FCC certification process yet and could, theoretically, change how it works before it comes out later this year. That said, while we can’t give you the final verdict on performance right here right now, we do know that the wireless Stadia Controller will have a slight edge on the Xbox One in terms of latency, as Google built it to work over Wi-Fi instead of Bluetooth. Connecting directly to your router could cut out crucial milliseconds of delay and save you lives in platformers and frustration in the real world. That said, although the controller looks like it’s meant to be used wirelessly, there is a USB-C port on the back that will be used for charging. Every Google rep we spoke to couldn’t comment on battery length (again, FCC clearance is key here) but told us that information will be made available publicly before the Stadia launch. What about all the new buttons on the front of the controller? Google Assistant (the three bubbles) is relatively self-explanatory – it’s your direct access to Google’s virtual assistant. During its opening keynote at GDC, Google told the audience that the Google Assistant could potentially offer tons of in-game functionality like walkthroughs, guides or another feature set specifically by the developer, but didn’t say whether we’d be able to use it for everyday tasks like turning off the lights or setting reminders. The other even-more-nebulous feature that you'll find on the Stadia Controller is the Share button that connects you straight to the streaming service. In its keynote, Google said that pressing the button will cause the service to create a second identical stream that will be posted live to YouTube Gaming that will act as a record of all your adventures in-game that can either be shared with friends, with your community or no one at all. When we asked reps to elaborate on that, however, most said that we'd have to wait for more information. For now we can assume that the controller and the service itself will have a close tie to YouTube Gaming and while we're not 100% clear on what form that will take, it seems like the Controller is the device that will be crucial to closing the gap. The old adage about not judging a book by its cover seems to apply nicely here: Until we know what it's like to hold and to use for an extended period of time, it's impossible to pass judgment on the Stadia Controller. That probably won't stop everyone else from doing it, however.To that end, expect to see a lot of polarizing opinions out there on the internet. Some will love it for its integration of Google Assistant and direct access to YouTube. Others will likely label its flat, space-age design as out-of-touch and awkward. But hey, if anyone can take a good hardware design and re-purpose it, it's Google.